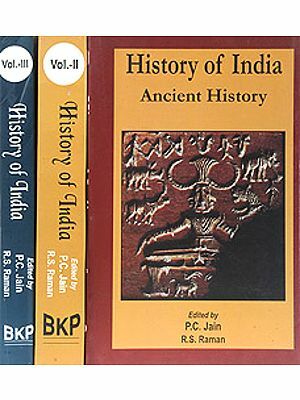 The Papers presented in this volume arise out of the session on money, banking and finance, organized under the auspices of the Indian History Congress, Kolkata, 2000. 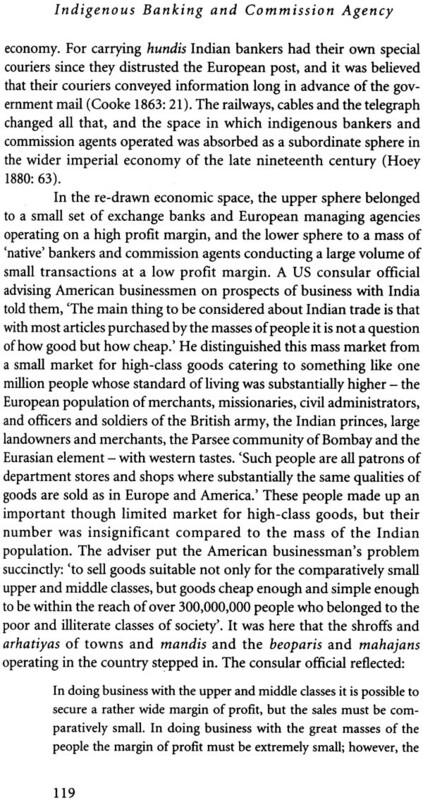 In most historical periods in India, groups of people have been engaged in exchanges of their products, with money being extensively used as a medium of exchange. There is no point, however, trying to define who exactly were the bankers, or bankers and money-changers, or bankers, merchants and money-changers rolled into one, without specifying the context. The essays in this volume specify the contexts in which apparently similar institutions of money and credit functioned in very different ways, and thus alert us to the infinite potential of human ingenuity. Further, they tell us something about the way the use of particulars institutions has a perceptible influences on the evolution of the larger society. Renowned economist and historian, Amiya Kumar Bagchi is Director of the Institute of Development studies Kolkata, Kolkata. He has also been Director of the Centre for studies in Social Sciences, Kolkata, for several years. His numerous publications include private investment in India 1900-1939 (1972), The political Economy of Underdevelopment (1982), Capital and Labour Redefine: India and the Third World (2002), and a four-volume history of India’s oldest and biggest commercial bank, State Bank of India. 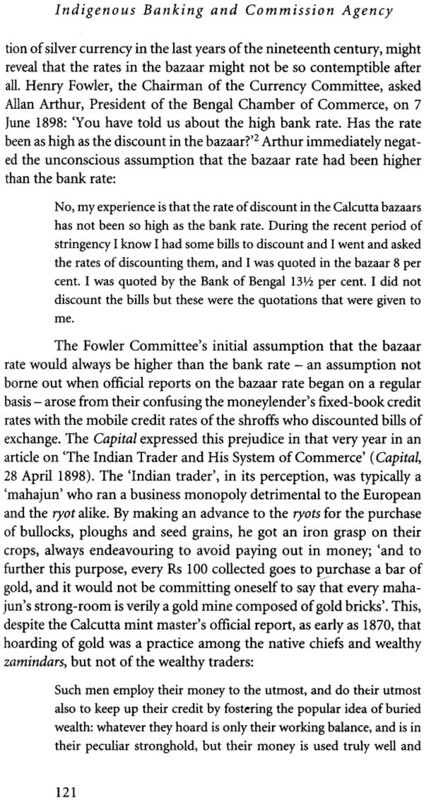 As Secretary, Indian History Congress, at the time, I had the privilege of organizing on its behalf a panel on Money and Credit in India since Early Medieval Times, at the 61st annual session on 2-4 January 2001, at Kolkata. I was happy that we were able to obtain cooperation from many scholars, so that not only did the deliberations at the panel, chaired by Professor Amiya K. Bagchi, prove most instructive, but the papers received were of such substance that the Indian History Congress decided to publish them in a volume and requested Professor Bagchi to edit it. He kindly agreed and has given us an excellent Introduction, as the reader will see. 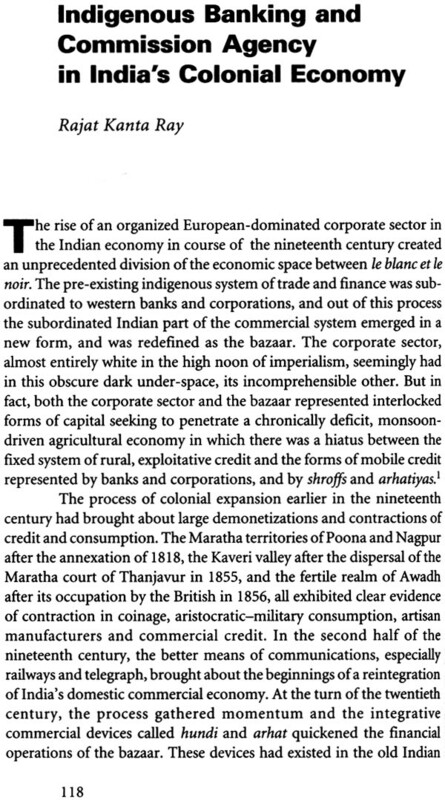 The Indian History Congress had decided to organize the panel in order to fill what it felt was a void in Indian economic history in the area of money and credit. The nature of source material did not give us sufficient confidence to begin from a period earlier than the early medieval (or, at one’s choice in nomenclature, the late ancient) period; the title of the volume makes clear the modest ambitions of the enterprise in terms of the span of time covered. The reader need not, perhaps be reminded that since the papers are pieces of research in particular aspects, a comprehensive coverage of the subject is not claimed for this volume. However, with both these limitations, it is hoped that the reader will find that the volume distinctly enlarges our knowledge of the field. The original panel and the present publication have been made possible by generous grants from the Power Finance Corporation, New Delhi, and a leading bank, which, to our regret, asked that its name be not publicized. We also received a subsidy from the United Bank of India, Kolkata. We are highly indebted to Dr Manmohan Singh and Professor A.M. Khusro for so kindly taking up our cause with the donors. During the panel and afterwards, I obtained much support from Professor S.P. Verma, the then Treasurer of the Indian History Congress, and from Professor Ramakrishna Chatterjee, the present Secretary of the Indian History Congress. Professor Irfan Habib gave me much guidance and help throughout the time with regard to both the organizing of the panel and the publication of its papers. Mr Muneeruddin Khan has processed all the authors’ contributions; and Mr Arshad Ali helped me most actively with the holding of the panel at Kolkata. Many thanks are owed to both. 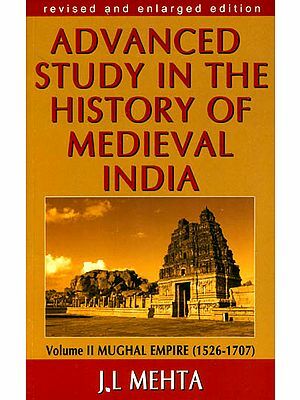 I have greatly benefited from the indulgence that Mr Rajendra Prasad and Ms Indira Chandrasekhar of the Tulika Books have always shown me, and if this volume has appeared in time it is entirely due to them. Human beings may or may not have a natural tendency to truck or barter, as Adam Smith thought. 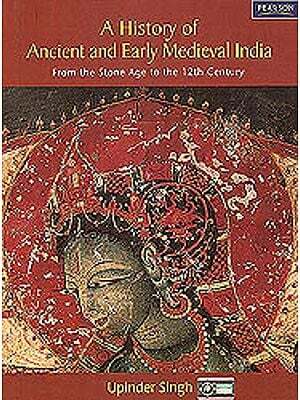 But in most historical periods in India, for which we have been able to recover the records of our ancestors, many groups of people were engaged in exchanges of their products with their neighbours, and money was extensively used in these exchanges. Families and clans became specialized in these changes and in the storing and circulation of money for facilitating these exchanges. These groups were then known as merchants, money-changers, and keepers and lenders of money. There is no point trying: define who exactly were the bankers, or bankers and money-changers, or bankers, merchants and money-changers rolled into one, without specifying the context. It is the function of historians to specify c contexts in which apparently similar institutions functioned in very different ways and thus alert us to the infinite potential of human ingenuity, and, when sufficient evidence accumulates, to tell us something about the way the use of particular institutions has a perceptible influence on the evolution of the larger society. 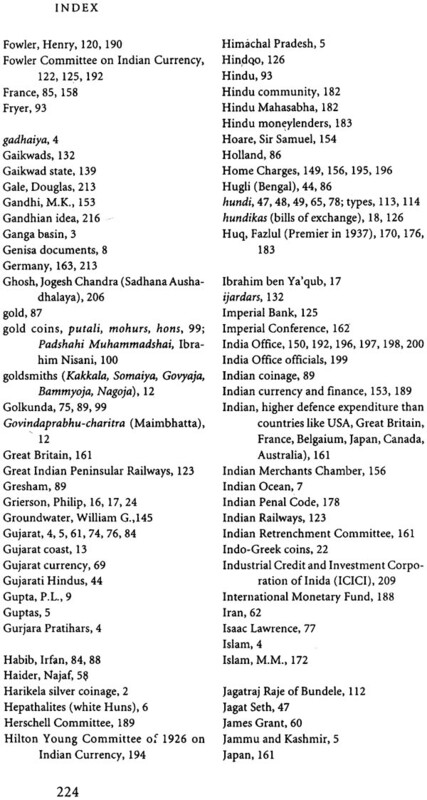 The anthology of papers presented here arises out of the session on money, banking and finance organized under the auspices of the Indian History Congress held in Kolkata in the year 2000 CE. The first paper in this collection, by K.M. 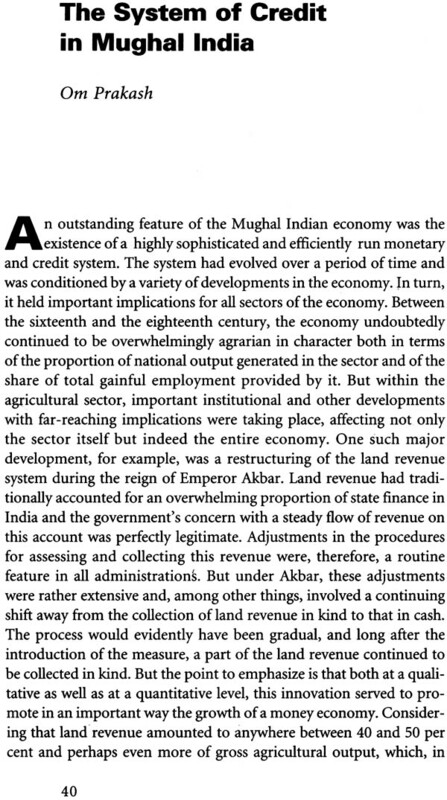 Shrimali, addresses a debate about the way the scarcity of money in the early medieval period may have strengthened the institutions of Indian-style feudalism as capitalized by major scholars in the area such as D.D. Kosambi R.S. Sharma. There are at least three different strands of this debate merit further analysis and research by scholars interested in the subject. First, there is the question of the facts of the case. 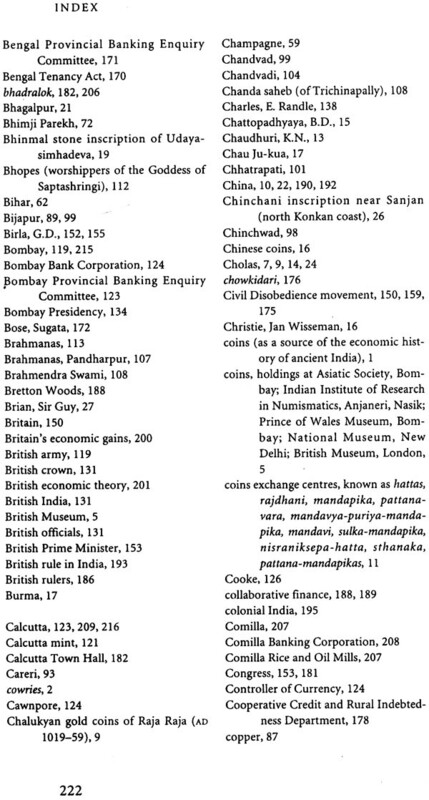 Did the supply of metals used for coinage decline in India during the early or late medieval period? Connected with that is the further question, ‘If the supply of the usual metals declined, did the users of money find substitutes in the form of other substances or in the form of networks of credit?’ If the answer is ‘Yes’, how durable or robust were these credit networks? 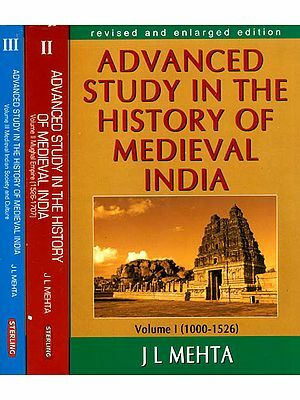 Is there sufficient evidence of a general decline of trade in India in the first millennium of the Christian era, and in particular between 300 CE and 1200 CE, which is supposed to have been associated with a decline in urban centres, a strengthening of the natural economy of villages, and thereby giving a fillip to the growth of Indian-style feudalism? The second issue is connected with the last question, namely, whether substitutability or innovation in coinage, money substances or credit networks is itself intimately associated with particular modes of production, or more generally with particular state systems and social formations. There is evidence from other lands that shortage of bullion and coins does not necessarily lead to a strengthening of feudal or personalistic ties or authoritarian state formations. For example, it has been claimed that for a hundred years before the beginning of the exploitation of the American silver mines by the Spaniards, Europe lived through a regime of currency shortage (Fossier 1986:428). But it is difficult to claim that feudal ties were growing stronger, at least in western Europe, during those years. A third issue is the delineation of the conditions under which increased mercantile activity is associated with a strengthening or weakening of feudal ties or ties of personal dependence. Was the ‘second serfdom’, dating variously from the seventeenth or eighteenth century, also associated with lesser mercantile activity and a monetary shortage? Shrimali’s paper prompts us to ask some of these questions again. The next set of papers pertains to the period of Mughal rule and the transition from Mughal to successor Indian states such as the Maratha Confederacy. There is a strong continuity in the institutional basis of the use of money and credit in the domestic economy of India from the late sixteenth century under Mughal rule and the late nineteenth century under British rule. 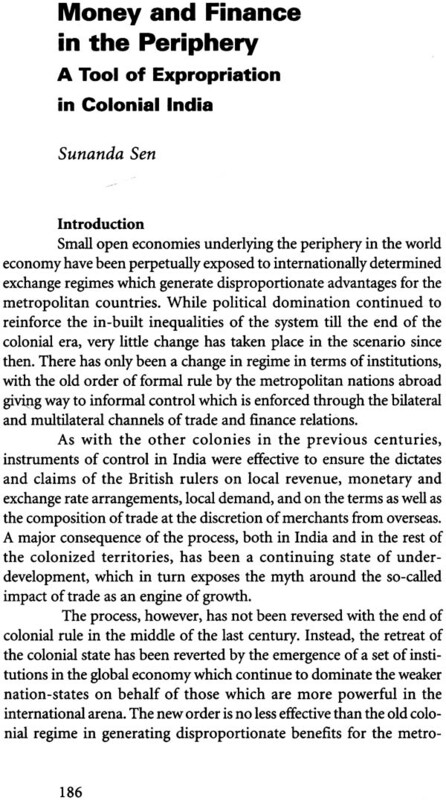 In order to grasp the nature of the continuity we have first of all to recognize that, however integrated the whole economy might appear from the vantage-point of Delhi, Agra or Calcutta, that integration concealed many breaks and differences of intensity of contact within the highly complex network of a commercialized economy which has not got rid of private coercive and discriminatory power in most walks of life. 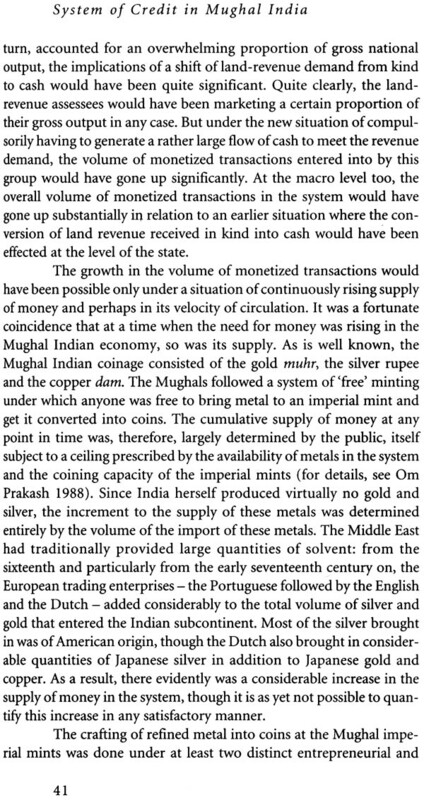 To be more specific, we should recognize that in Mughal India as in British India, there were many circuits of exchange of goods and money, very often (but not always) with different kinds of money being used as the typical medium of exchange in different circuits. Concurrently and overlaying these connected but separate circuits of exchange there were also circuits of credit very often with the same controllers on the lending side operating different circuits with different rules. Even at the top of the hierarchy and circuits of exchange, the royal money or the publicly recognized money might have strict limits within which they might be used and it would be wrong to generalize about the effects, for example, of the effects of changes in the supply of such money without recognizing those limits. To take two examples from the Mughal period and late colonial period, respectively, how many peasants or artisans ever handled a mohur (muhr) with the imprint of the reigning Padshah, and how many of them ever handled even a 100-rupee note, let alone a 10,000-rupee note, issued by the colonial government? 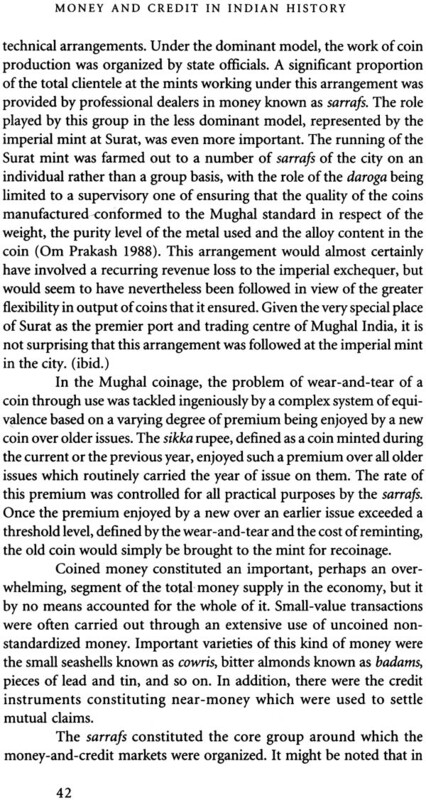 The paper by Najaf Haider in this anthology raises a very interesting question that is pertinent beyond the borders of the Mughal economy: ‘What dominated the supply of medium of exchange, the supply of metallic coin or the system of credit which often obviated the need for any metallic coin?’ That question can rarely be answered with precision under most circumstances. But the question has still to be asked because the meaning of money supply itself may change with changes in political and economic circumstances, and the state of credit is even more susceptible to such influences. Let me first look at the way metallic money circulated. In many territories, the rulers did not try to impose one single type of coinage on their subjects. In these cases the values of the different types of coins were determined by the intrinsic worth of the metals and their relative values as determined by forces of supply and demand. Demand was, however, very greatly influenced by mercantile usage or by political factors outside the particular realms. In the present anthology, A.R. 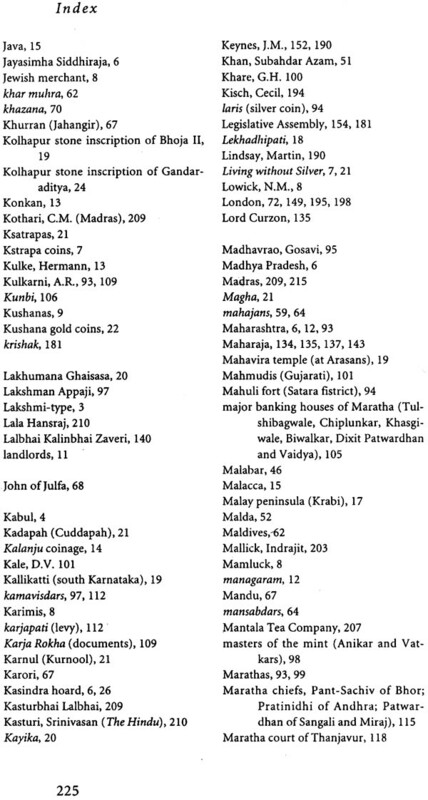 Kulkarni has vividly brought out the freedom with which coins of very different provenance circulated in the territories ruled by the Marathas. 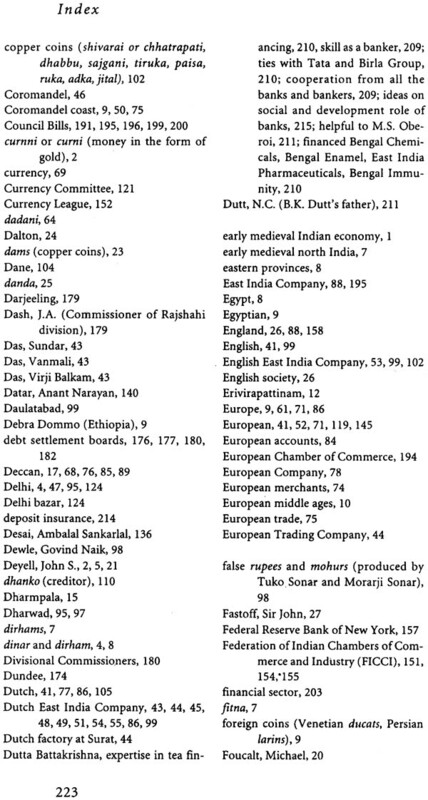 Interestingly, the Ottoman empire, a much more durable and extensive empire than the empire of the Maratha Confederacy, also lived with a multitude of coins (Pamuk 1994, 2000: esp. chapter 11). In such circumstances, the rates of exchange of the different coins were influenced by pulls of supply and demand in the larger macro-region in which the particular territory was located, and ultimately in the global economy. If it happened to be the case that the particular territory ran up a persistently adverse balance of trade with the rest of the world, then it could experience a severe shortage of coin and the realm could suffer economically, unless there were financiers willing and able to lend their resources to the particular state. 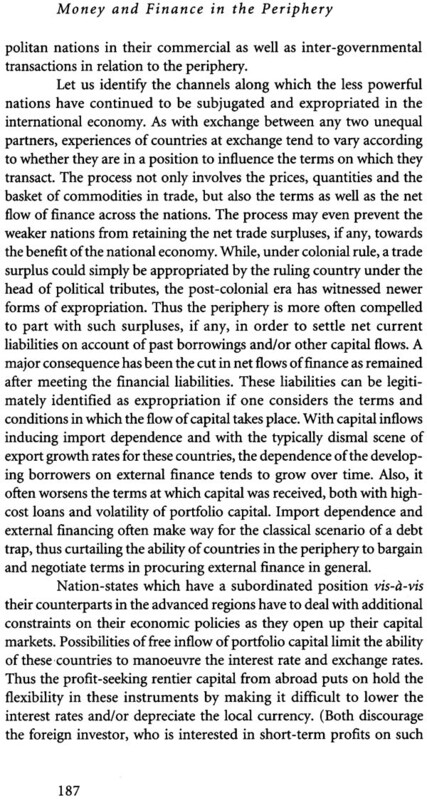 Even in cases in which there were no long-run problem of balance of trade, the particular territory could suffer because of a shortage of liquidity. A properly organized credit system could take care of the temporary problem of shortage of cash. But in case of persistent balance of trade deficits, only a public credit system which would be supported also by an expanding revenue- raising capacity of the state can prevent depression and contraction of the economic base of the particular territory. 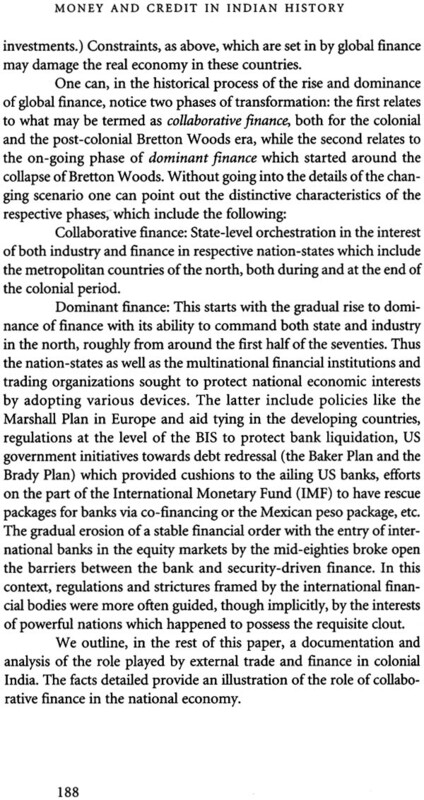 Such a public credit system could arise only in states run in the interest of merchants and financiers; thus such a system was first born in the Italian city-oligarchies of Genoa and Venice and found its full maturity in the first industrializing nation, namely, England (Dickson 1968; Dickson and Sperling 1970; O’Brien 1988, 1994; Brewer 1989; Tattara 2002). I shall later explore the implication of the absence of a public credit system in India before the coming of independence. 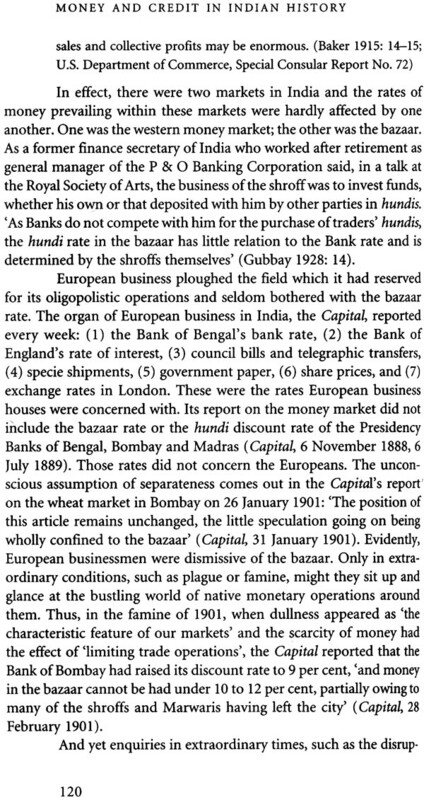 In the case of Mughal India, it is difficult to disentangle the respective roles of the money supply and the private credit system, precisely because the country enjoyed a persistent balance of trade surplus so that the criticality of credit as a supplement to cash cannot be established by observing a situation in which the Mughal empire experienced a shortage of the liquidity needed to support current economic activities. Private creditors were, of course, connected by various net- is of trust, and these networks could extend even to lending to a person- on the basis of security rather than on the basis of personal knowledge Bearer hundis would illustrated this: these hundis, however, still bore the name of the original issuer. Most moneylending would take the form of what would be known later as relationship banking (for ana1ysis of relationship banking, see Besanko and Thakor 1993, and Lamoreaux 1994). Within the privileged networks of bankers, cash could often be dispensed with as illustrated by the practice of Gujarati bankers to fix on settlement days and renew the loans on an agreed anth or discount for the postponement of the settlement. This kind of transaction could sometimes be unsettling for the rulers since they might not be able to find out whether a banker was preventing an inevitable bankruptcy by continually postponing the day of reckoning, or whether he was simply unwilling to reveal his hand. But the rulers wanted to be certain that public dues would be paid in generally acceptable coin, and would not be snarled up by bankruptcies or non-transparent transactions. So, from the post-Mughal times to the British period, attempts were often made to ban the system of anth, but the systems seem to have kept alive many transactions or productive economic activities which would have collapsed without it (Ali Muhammad Khan 1761/1965; Habib 1982; Bagchi 1982). 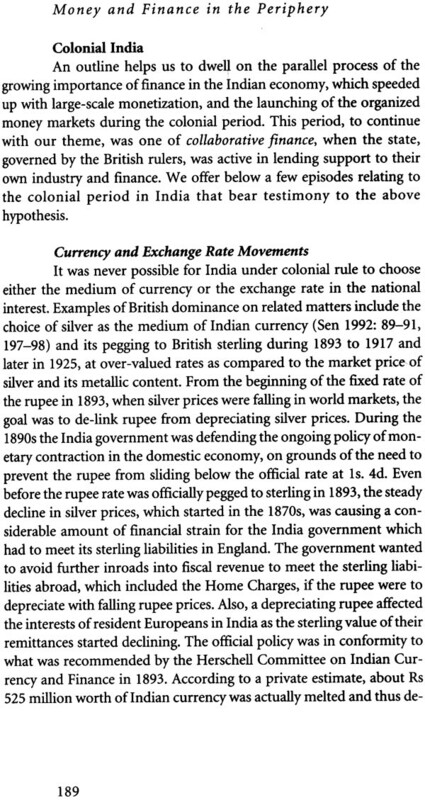 Najaf Haider, Shireen Moosvi and Om Prakash in their papers have discussed the way rates of interest behaved in Mughal India. I only want to add the following remarks to complement their discussion. First, when these authors mention regional differences in rates of interest or changes in rates of interest, and analyse the influence of such factors as differences or changes in money supply, import of bullion or demand for credit as factors causing those differentials or changes in interest rates, their analysis primarily, or even exclusively, bears on what may be called prime lending rates. The capital market, is, the market for loans and borrowings, are by their very nature highly imperfect, and in every country, and especially in a country that is primarily dependent on the production of primary products, rates of interest and the availability of credit travel a steep gradient along the axis of the degree of creditworthiness: the latter is determined in its turn by a complex of factors among which the size of the collateral or security for the loan, the liquidity or cash flow generated by the project financed by the loan, and enforceability of the explicit or implicit contract, all play an important part. 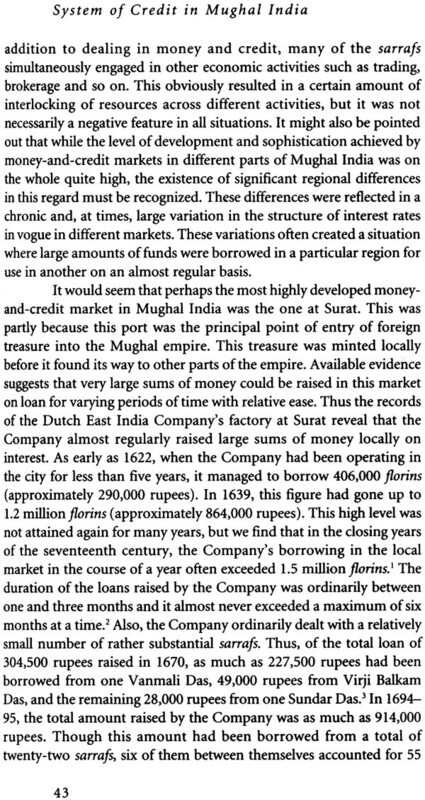 In all these dimensions, the peasants and artisans of a country like India under Mughal or British rule would have faced the steep part of the gradient plotting the terms and availability of credit. We need to know a lot more about the terms of lending to these classes of people before we can decide whether they benefited at all and if so, to what extent, by the fall in the rates of interest in the second part of the seventeenth century. Secondly, even for the great and the mighty a fall in prime lending rates in the period concerned may not always have meant a better deal for them from their usual creditors. For example, even as rates of interest were easing up for businessmen in England and the Netherlands , the declining empire of Spain and the aspiring kingdom of Louis XIV often found it hard to raise money for their armies and administration except on rather onerous terms. Even Charles II of England was impecunious enough to have to go back on his contract with the goldsmiths of London. This is where the sound construction of a system of public credit - in the Netherlands since the early seventeenth century and in Britain since the early eighteenth century - played their part.